I am starting to get why people do this. During our last offshore passage, from Southport, NC to Charleston, SC, I had the duty of being on watch from 4am until 6am. It’s the coldest shift and the sleepiest shift, but it’s also my favorite because of the sunrise. On land, I am not a morning person. In fact, my morning grogginess is the topic of some ridicule from Fabio. This summer, while we were doing the yard work, he would bounce up and be dressed and ready to go by 7:30. Over the course of the summer, he developed a set of strategies to ease me into motion, some more successful than others. There would be hot coffee delivered to my bedside table, songs sung in a warbly Italian accent, and, ultimately, glaring and toe-tapping from the door. But on the boat it’s me up at dawn. If we are close to land, I hop up, grab my camera, and canvas the docks and adjacent neighborhood for hours, eventually reporting back to Fabio on proximity to coffee, library, and points of interest (usually food-related), complete with photographic evidence. 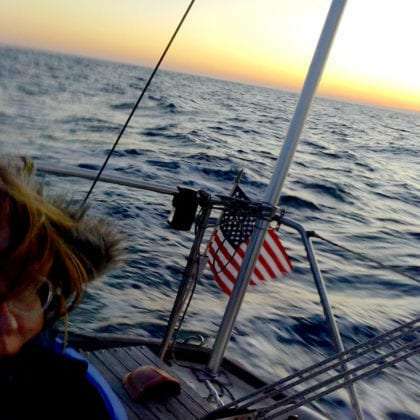 This last overnight passage, we divided the watch duties into two-hour shifts, with one of us napping and one of us responsible for navigation at all times. I asked that we schedule backwards from the daybreak shift, so that I would be the one on the tiller. The night watch sounds creepy, but its actually not. Your eyes get accustomed to the dark, and the navigational markers are actually easier to see lit up at night. Its quiet in a way, except when you hear the exasperated commotion of a sleeping seabird that you just woke up, followed by their angry calls as they sleepily flap away. This passage was during a full moon, which is remarkably bright if you have clear skies. Between the moon itself and its reflection on the waves, a constant sparkle motion surrounds you, and it is hard to keep your eyes on the road. Luckily the road is rather wide, and you are free to bask or boogie, whatever moves you. I settled in to watch the “moonset” as the moon ultimately dove down to the horizon. At the last moment I noticed a pinkening glow behind me. A great red sun was rising – I forgot – this was the sunrise shift! I was so shocked by this discovery–the sun could rise at the exact same moment that the moon was setting! I looked back and forth in amazement between the distinct halves of the sky. For a moment, I felt like an early seafarer making a new discovery about the working edge of the known world. This is why you go to sea! Who else had ever seen this but the night watch? There was some dancing around and I barely resisted the urge to wake Fabio early. 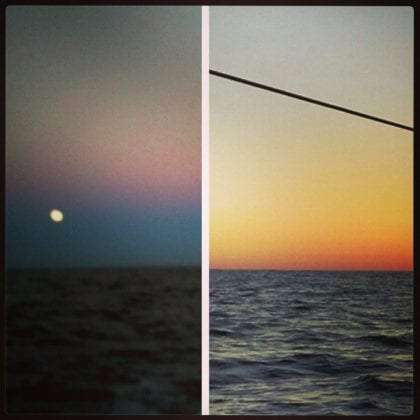 Later, I was informed – via Instagram, no less – that this was, by definition, a full moon, when the moon and sun are directly opposite one another, and it happens every month. I was a bit deflated that this is such a common occurrence, I will admit, but I was no less excited to “discover” that the moon rose just as the sun touched down, later that evening during Fabio’s sunset shift.